To be completely honest, I don’t understand people missing Sunday (or Saturday) worship. This isn’t because I’m a pastor. I’m not saying that because I’m worried about attendance. As a fellow Christian, I just can’t understand why people would stay away from weekly worship where we receive the true Body and Blood of Jesus Christ, our Savior. I just don’t understand it. Of course, I understand all the reasons people give. I can kind of understand someone missing Sunday worship if you have to work on Sunday. But then, why not find a church with Saturday service? If you work on both Saturday and Sunday, why not find a congregation which offers a midweek service? I understand if one is sick or in the hospital. But then, call your pastor who will bring you the Lord’s Supper. I understand one may not be present if traveling on Sunday. But again, why not come on Wednesday, or Saturday? My devotion to and appreciation for the presence of Jesus Christ, God’s Son and our Savior, is so deep and abiding, that I can’t bring myself to NOT receive Him in the Sacrament of the Altar as often as I possibly can. I’m not boasting—I’m simply stating that when Jesus offers Himself to us in His Holy Supper, I want to be there to receive Him. 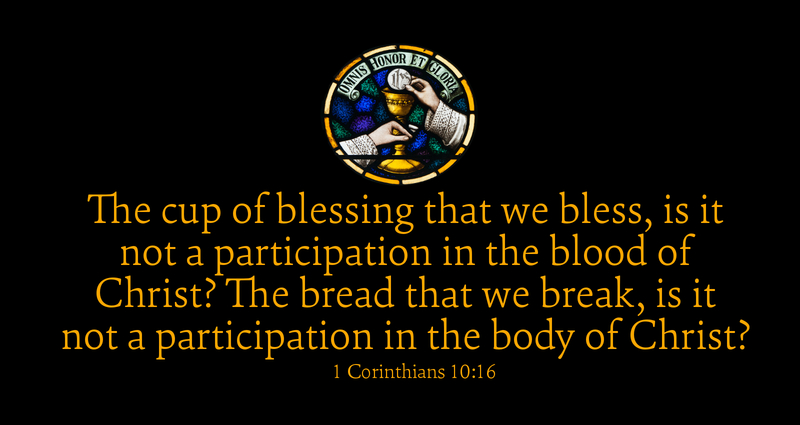 As St. Paul says, “The cup of blessing which we bless, is it not a participation in the Blood of Christ? The bread which we break, is it not a participation in the Body of Christ?” Jesus offers to us His real presence each week—Jesus comes to us in Word and Sacrament. Is it too much for us to come regularly and faithfully? One of the most helpful Lenten practices is a commitment to receiving the Body and Blood of the Lord whenever possible! Prayer: Lord Jesus Christ, because you offer yourself to us each week in the Lord’s Supper, draw us to your altar, that we may receive your Body and Blood; in your name we pray. Amen. Pastor, Your Devotion for today 3/7/16 was “right on target”! Thank you for thinking out loud on this subject. I to wonder why people find reasons every week not to go to church. Communion for me is habit forming. I feel lost all week without it. I don’t understand why some churches only offer this a few Sundays in a year???? Looks like folks don’t know what they are missing. I do, the SPIRIT of God within us , ALL WEEK LONG.. Gods Blessings on you. Barbara Matthews, Reformation Lutheran Church, New Bern, N.C.